Those of us who use our critical thinking in weighing the fitness of candidates to the positions they are running for usually complain that it is difficult to do so intelligently because elections in our country are personality-oriented and not issue-based. This is the saddest reality of our country’s political system. The masses are entertained with bombastic style of campaigning, and candidates throw mud at each other. But after elections, when they sit in their offices, they implement the same policies that do not truly redound to the welfare of the people. This is of course just a general statement. There are many incumbent officials, in our congressional, provincial and city governments, who have done their best and continue to do so despite the systemic limitations. But we cannot just be content at allowing the voters to be duped by deceptive pretenders who claim that they will bring in better governance even if their own track record does not show it. There should be a better way of educating voters on how to test the candidates’ mettle. This is what a group of intelligent voters did when they took the initiative of coming together and reflecting on how they could raise the level of discussion in this political season. One of the best ideas they devised was to point out current developmental issues and then ask all candidates and their backers to make commitments as to how they will proceed to treat these matters if they win. This is the most important thing to remember, what are they going to do with our country, province, city or municipality once they hold office, not the money that goes with the sample ballot. If you do not consider the development concerns, you are most likely not an intelligent voter. Are you or your backers going to implement the RECLAMATION Project at Panglao Island? Those who say that this is not a current issue are lying. The truth of the matter isthat this is a very hot issue now being debated at the Court of Appeals. The current Provincial Administration passed Resolution No. 2011 – 673 authorizing Governor Edgar Chatto to cancel the Agreement with Oasis Leisure Islands, Inc. on the proposed Reclamation at Panglao Bay because studies have shown that it “presents a clear danger to the healthy biodiversity and sensitive marine environment”,and Resolution No. 2011 – 675 opposing the establishment of any form of reclamation within the shores of Panglao. Mr. Norris Oculam who spearheaded by Reclamation Project opposed the stand of the Provincial Government, that is why there is a pending case. Are you or your backers going to implement the RECLAMATION Project in the town of Buenavista where there was massive cutting of mangrove trees to the consternation of environmentalists? Are you going to uphold the ban on Genetically-Modified Organisms (GMOs) in Bohol which has been institutionalized by an ordinance? This is also upheld by our Provincial Code of Organic Agriculture. If you plant GMOs it will contaminate other plants nearby. That is why it is banned. What is your stand about the possibility of some investors planning to put up casinos in our province? Our current Provincial Government passed Resolution No. 2019-197 expressing its sentiment against the operation of casinos since they are contrary to the values of Boholanos and considered a threat to our religiosity and social peace. Are you going to ban single-use plastics throughout the province? This is now an urgent call throughout the world. Do you care enough about these crucial issues? What is your stand,or your backers, about mining? A businessman from Cebu used to have a monopoly of mining claims in our province. What is your stand on this? Both President Duterte and Miss Gina Lopez have strongly opposed mining. What is your stand about corporate farms that emit hazardous and foul smell to the detriment of the families living in their vicinity?Are you going to support the noble project of turning the Abatan River into an ecological museum to protect its diversity and pristine waters? 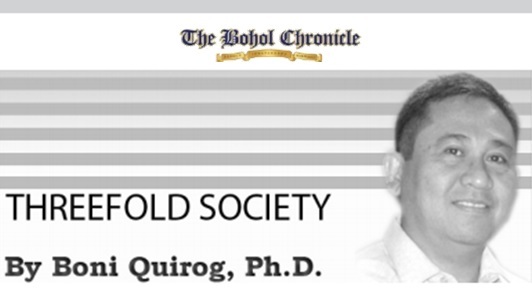 All the so-called mega projects should be subjected to further in-depth and broad-based scrutiny; and the mandates of the Bohol Covenant for Sustainable Development and the Bohol Environment Code must be upheld. Let our Provincial Government focus on more basic physical infrastructure and human capital needs such as renewable energy, clean water and sewerage, education, and health services which are the true potent vehicles to usher our people out of poverty. Promote green transport such as e-jeepneys, e-buses, e-tricycles wherein our local governments shall facilitate access to affordable loans during the period of transition. Promote zero-waste management such as compost pits in home backyards; and adopt such other proactive measures like sustainable agriculture to adapt to climate change. These are the issues that really matter for us and our next generation.